Accurate customer data can mean the difference between a productive sales call & a waster trip. Yet an estimated 1 in 25 customer visits is unsuccessful, because sales reps don't have current data in CRM. Join over 100 top pharma companies using Veeva OpenData today. Call Veeva Sales at 1-866-200-4739 or complete the form to watch the video to learn how you can get more productive reps with better customer data..
Veeva OpenData delivers the right customer data, right where it's needed. 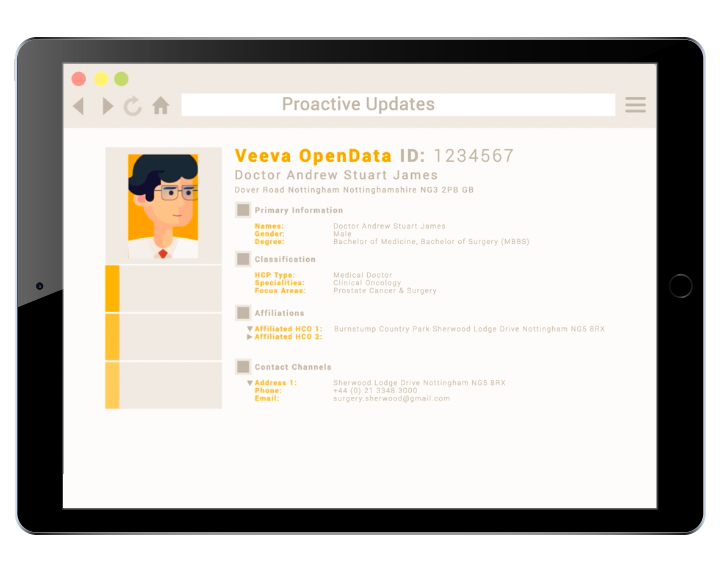 Veeva OpenData provides comprehensive records for healthcare professionals (HCPs), healthcare organizations (HCOs), and their affiliations. Data is sourced from reputable government and industry organization, and verified by Veeva stewards, ensuring the highest levels of quality and coverage. Designed with a global view, Veeva OpenData provides a consistent standard of quality and service across all worldwide markets. For more information, visit www.veeva.com/opendata.